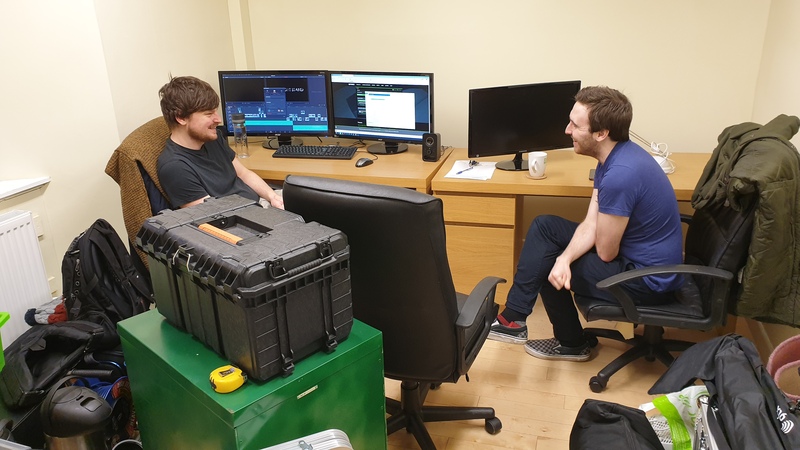 I meet Joel Hewett and Daniel Taylor, two filmmakers from Dundee, at their new office in the city centre. By new, they tell me, they mean days old. Most of the equipment is still in boxes. Parts of a shelving unit are stacked in the corner, waiting to be reconstructed. A computer is up and running, the screen showing a working edit of Taylor’s new production, One Night Stand. They’re working fast – the film will be screening, along with Hewett’s Waterproof, at the DCA on the 23rd of March – giving the directors two weeks from my visit to finish and finalise the cut. If nothing else, the films have represented an opportunity for the people behind them to push their own limits. “I think we learn with each film,” Taylor goes on, “I’m now looking at what the next project will be and I think ‘what else can we do? What will be fun to do?’” New technologies have created more possibilities for filmmakers, but also more competition. Hewett mentions that “there’s a really cool independent film scene that’s growing around the UK,” citing the options available now for those with zero budget, “I do think in the next few years it’ll be huge for independent filmmakers because the access is there.” Taylor comments that “fifteen years ago people would have had to shoot it on film and that would have been prohibitively expensive,” whereas, as Hewett explains, “you see films being shot on iPhones now. You see films being shot on cameras that are probably less than a thousand pounds” which means it becomes harder than ever for a new director to stand out from the pack. As to whether Waterproof and One Night Stand will grow beyond that community, the pair seem uncertain. Hewett tells me simply that “it’s been a dream growing up to be screened at the DCA,” but Taylor maintains the collective spirit, insisting that “getting it shown publicly is not an ego thing.” Hewett agrees that, really, the screening is for the cast and crew as much as themselves, expressing hopes for applause and “thanks for all that hard work.” These thanks sound well deserved – the production covered expenses but the cast and crew of these films worked for free. “Everyone,” they tell me, is at a point in their lives that neither director would feel comfortable asking for that again. Taylor accepts that he’s “got loads of dream script ideas” but doesn’t know if they’ll ever get made.